The transparency organization WikiLeaks has exposed acting President Michel Temer, who ascended to the Brazilian presidency after a soft coup deposed President Rousseff, as having been an intelligence informant for the United States. Temer, who has served as Brazil’s vice president since 2011, took power Thursday after Brazil’s parliament suspended Rousseff pending the results of impeachment proceedings. The cables — marked “sensitive but unclassified” — contained summaries of conversations Temer, a Brazilian federal lawmaker at the time, had with the U.S. intelligence officials. The damning evidence was provided in a series of tweets by the WikiLeaks Twitter account that linked to diplomatic cables highlighting the information provided to the U.S. military and National Security Council by Temer. Clearly, the evolution of Unconventional War (UW), spelled out in the 2010 Special Forces Unconventional Warfare manual, has come to full fruition with the events that have unfolded in Brazil. This has unfolded in the form of Hybrid War, which is essentially a weaponization of chaos theory – widely embraced across the U.S. military/intelligence spectrum. The UW manual highlights the perceptions of a vast “uncommitted middle population” is essential in the road to success, and that these uncommitted eventually can be turned to oppose their political leaders. The process encompasses everything from “supporting insurgency” (as in Syria) to “wider discontent through propaganda and political and psychological efforts to discredit the government” (as in Brazil). It explains that when an insurrection takes root and begins to escalate, the “intensification of propaganda; psychological preparation of the population for rebellion” should as well, as has been the case in Brazil. BRICS is the acronym for an association of five major emerging national economies: Brazil, Russia, India, China and South Africa. The grouping was originally known as “BRIC” before the inclusion of South Africa in 2010. This in large part explains the turmoil in Brazilian civic society. Although there are many structural problems inherent to the political apparatus in Brazil, these issues were exploited by external powers in an effort to create a more politically appealing environment for the U.S. and their neoliberal cronies to maneuver into positions of power as exhibited by U.S. intelligence informant, Temer ascending to the presidency of Brazil. “The right wing is the driving force of the protests… Two of the principal groups responsible for organizing and mobilizing the demonstrations are the Free Brazil Movement (MBL) and Students for Liberty (EPL), both of which have direct ties to Charles and David Koch, the right-wing, neocon, US billionaires, as well as other leading figures of the far right, pro-business neoliberal establishment,” Draitser wrote. Make no mistake that there is a massive covert effort by the U.S. to maintain their hegemonic position in global affairs — undertaken by any means necessary — and aimed squarely at the BRICS. 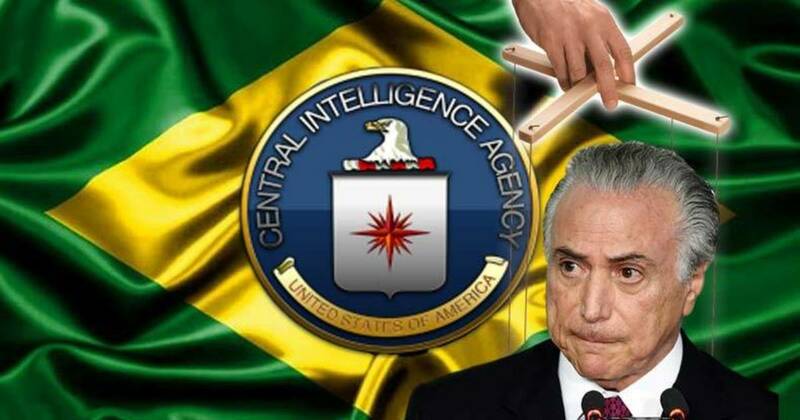 The events in Brazul are unquestionably yet another orchestrated coup organized by Washington. This new form of sophisticated Hybrid Warfare has shown itself to be an insidious weapon that can foment regime change without firing a single shot.